I'm sure I'm not alone in planning every year to get all my Christmas shopping done in November and beat the crowds. I'm sure I'm also not alone in failing in the mission year in and year out. To give us the best chance possible, I've put together some November sales to inspire, activate and help us all to not be caught in the Christmas retail crush this year. What to expect: Thinking of buying clothing gifts for everyone this year? Then the Brand Collective sale is for you! Brands include: Superdry, Mossimo, Freshjive, Hush Puppies, Mooks, Julius Marlow, Everlast, Neon Blonde, Stussy, Volley, Sachi, Neff, Harrison, Dunlop, Slazenger, Clarks, Obey and Grosby. Phew! What a list. Running from Friday 7 November to Tuesday 23 December, 10am – 4pm everyday. You can access the sale via public transport on the 112 tram, alight at stop 30, or the it's an easy walk from Northcote or Croxton train stations. What to expect: The Amor y Locura Mexican Warehouse Market Sale will be brimming with Mexicana handcrafts and homewares, gifts and trinkets. Expect the unexpected and a face-full of colour! You can access the sale via tram 96 up Nicholson Street. Doors are open from 10am - 4pm. What to expect: Mink Pink is a relative newcomer to the women's fashions scene, and stick a range of grunge, pop and in-sytle clothing and accessories. The sale promises that new stock will be being put out every day so there's no need to fret if you cannot make it on Thursday or Friday. As well as offering up to 80% off designer labels, the sale also boasts a photo booth and live music, which should give you some indication of the sort of clothing on offer also. If you know your brands, this is for you. 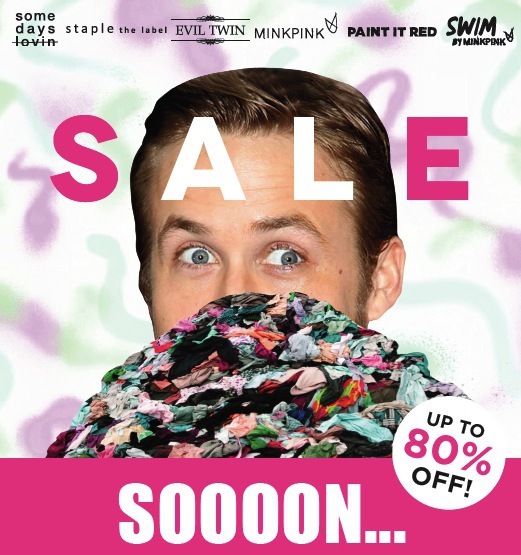 The sale is stocking: Some Days Lovin', Staple The Label, Evil Twin, Paint It Red, Mink Pink & Swim by Mink Pink.The sale is open at differing times each day, see below for details. What to expect: The Linen House sale will stock great brands such as Linen House, Aura, Hiccups, Designers Guild, Marie Claire & More, all at great prices. Expect quilt covers from $20, sheet sets from $30, blankets from $30, towels from $7, bathrobes from $15 and table Linen from $5. Doors are open from 9am - 3pm daily from 13 - 15 November. What to expect: Coined as Melbourne' biggest toy sale, this is one not to be missed if you're buying for little ones this Christmas. Stocking brand names such as Little Tikes, Lalaloopsy, Baby Born and many others. Doors open at 8am and the sale closes at 2pm (last entry 1:30pm). If you need more inspiration to get there early, there will be a coffee cart set up for early-risers. What to expect: A huge range of secondhand books available for $1 or less. Held four times annually, this is a great way to snap up a bargain and set yourself and all your friends up for a summer of lounging with literature. Doors open from 10am – 3pm. The Darebin Libraries Book Sale is a 1.8km walk from Reservoir train station or 1.9km walk from Ruthven train station. What to expect: Shopping and supporting charity? I'm in! You can expect to see clothing from top Australian and European brands on sale at up to 90% off the retail price. The sale even has an ambassador, blogger and stylist Jess Dempsey, who will let you in on the tips to finding the best bargains on the day. Entry is via a gold coin donation and all funds raised through the sale will go to Very Special Kids, a local charity that supports families caring for children with life-threatening conditions. What to expect: Whilst not strictly a sale, this is one great opportunity to pick up a bargain of the hand-made and unique variety. Online super-store Etsy, is holding its first-ever Christmas Pop Up Market in Melbourne. The ethos of Etsy is to directly connect the creators of goods with the public. No need for a middle man or extra commissions. Etsy helps creators to keep their prices low by allowing them to step out of the traditional retail shopfront environment and move online for a fraction of the cost of building their own website. This leads to lower overheads and better prices! Win/Win! The Etsy pop-up market will run from 6pm - 10pm, Friday 28 November. Perfect for the hipster of the family or a parent who prefers unique pieces, rather than brand names. Why? Helping you to get your Christmas shopping done in November! Huge Christmas and Toy Sale! !